this is my four year old daughter wearing this outfit that I made at home. I got the idea from the internet. First I made the toadstool with a sled. I cut the waist out of the sled and then covered it with red material and added white circles for the toadstool also. 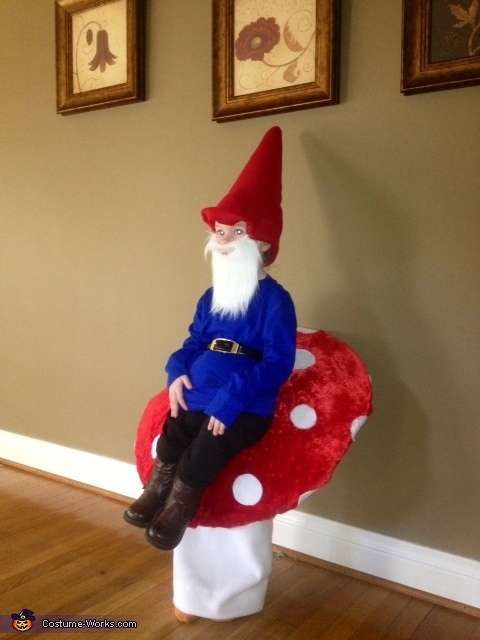 For the stem I made a white skirt so you couldn't see the legs and for the gnome itself I drilled holes to the sled and tied shoes down on the toadstool where it looks like the gnome is sitting. This costume is a one of the best homemade costumes this year.